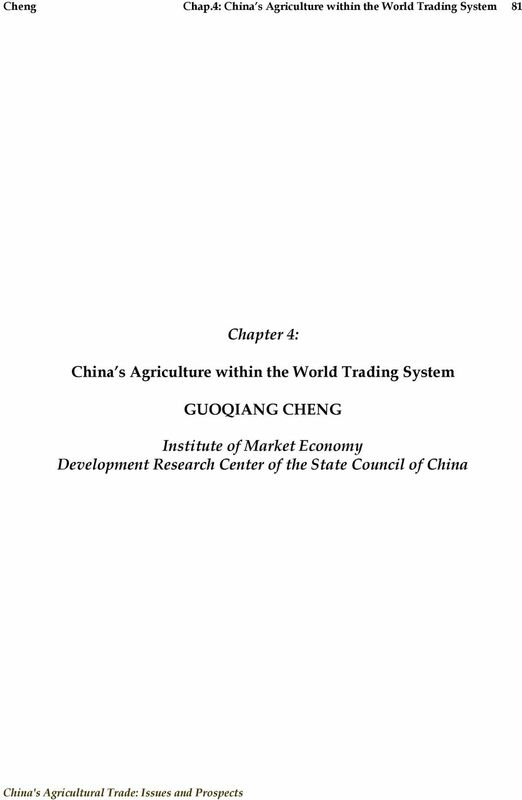 Download "Chapter 4: China s Agriculture within the World Trading System GUOQIANG CHENG"
3 Cheng Chap.4: China s Agriculture within the World Trading System 83 agriculture declined to 42.6%. Agriculture s share of total exports dropped from 26.7% in 1980 to 3.2% in 2006, while its share of total imports dropped from 33.8% to 4% in the same period. Figure 1: Contribution of Agriculture to China s Economy RMB10,000 % GDP Agricultural Gross Value Added Share of agriculture in GDP, % Share of of agriculture in employment, % Source: NBSC, China Statistical Yearbook (All issues) Table 1: Changes in the Structure of China s economy (%) Share in GDP Agriculture Industrial Service Share in employment Agriculture Industrial Service Share in total exports Agricultural products Share in total imports Agricultural products Share of rural population Source: NBSC, China Statistical Yearbook (All issues) Performance of Agricultural Growth: Since the foundation of the People s Republic of China, agriculture has gone through the stages of land reform, agricultural cooperatives, rural communes, market-oriented reform and opening up to the outside world. The rural communes and state monopoly for purchasing and marketing that were in place before 1978 seriously dampened farmers incentives, and led to slow development. The structure of agriculture was not diversified at that time, and rural areas suffered from poverty and underdevelopment. 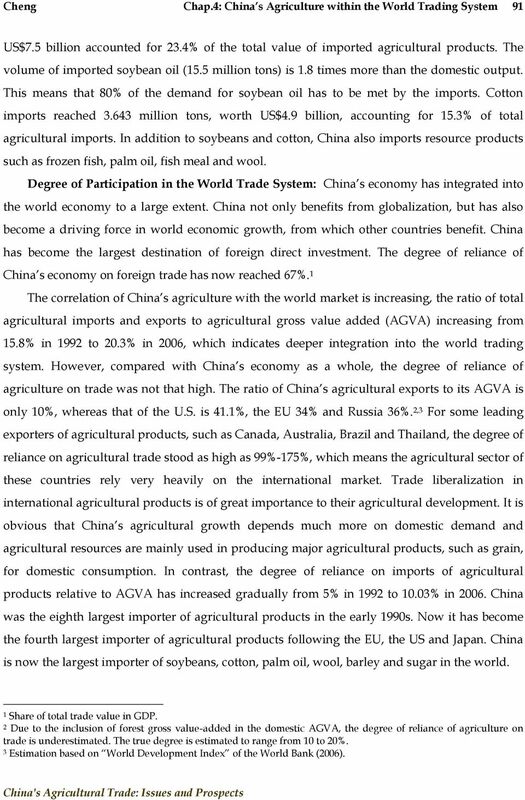 9 Cheng Chap.4: China s Agriculture within the World Trading System 89 and the fourth largest agricultural importer, following the EU, US, and Japan. China now plays a significant role in the world agricultural products market. Despite rapid growth of China s trade in agricultural products, the share of agricultural exports in total exports has shown a downward trend. The share of agricultural exports in total exports declined from 13.3% in 1992 to 3.2% in 2006, while that of imports fell from 6.6% to 4%. In some other countries, however, agricultural exports account for a significant portion in their total trade volume. For example, the exports of agricultural products in New Zealand account for 50% of its total of exports. For other countries, the share of agriculture in total exports is 20% in Chile, 28% in Brail, 17.2% in Australia, 11% in Thailand, 7.2% in Canada, and 7.5% in the US. The growth of trade in China s agricultural products indicates that participating in international competition and sharing the benefits of global integration have played an important role in China s economic development. First, agricultural exports still make great contributions to China s foreign exchange reserves. From 1992 to 2003, China s cumulative foreign trade surplus reached US$ billion, and the cumulative net value of agricultural exports reached US$51.33 billion, accounting for 21.2% of the total surplus, of which US$2.62 billion of the net value was achieved in This figure accounts for over 60% of the trade surplus for the whole country. The net agricultural exports in 2003 reached US$2.35 billion, 9.2% of the total trade surplus. However, since 2004, China s agriculture began to witness a trade deficit, ending the contribution of agricultural trade to foreign exchange reserves. Second, agricultural exports play an important role in creating employment opportunities for farmers, increasing their income, restructuring agriculture, and enhancing agricultural competitiveness. Some studies have found that China s export multiplier of agricultural products reached 1.66 in 2002, which means that US$1 of agricultural products exported could create an additional US$1.66 worth of economic activities. Every US$10,000 of such exports can directly and indirectly create nearly 28 jobs (Cheng, 2004a). 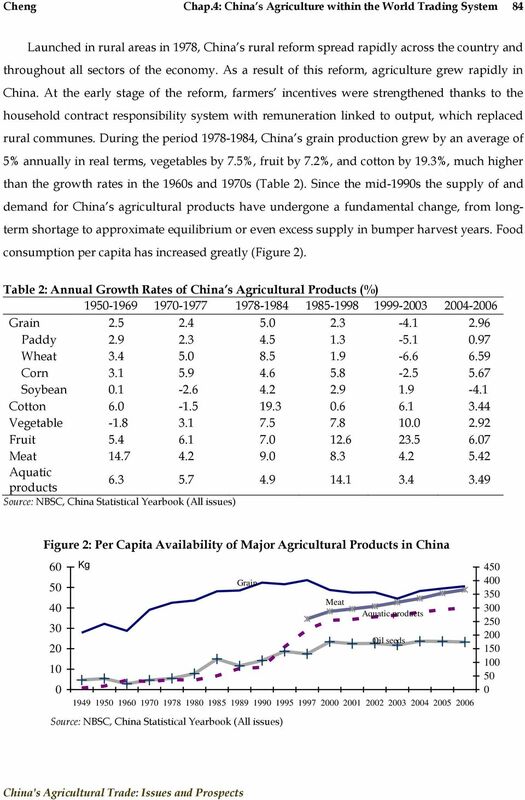 Table 5 indicates that laborintensive agricultural products accounted for more than 76% of China s total agricultural exports, and the share is still rising. This is significant in that it enables China to enjoy its comparative advantage in agriculture and increase its agricultural competitiveness. 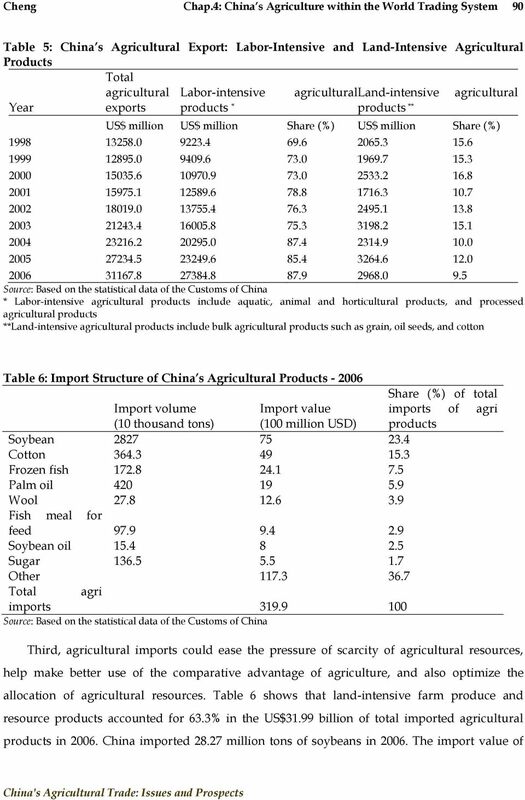 11 Cheng Chap.4: China s Agriculture within the World Trading System 91 US$7.5 billion accounted for 23.4% of the total value of imported agricultural products. The volume of imported soybean oil (15.5 million tons) is 1.8 times more than the domestic output. This means that 80% of the demand for soybean oil has to be met by the imports. Cotton imports reached million tons, worth US$4.9 billion, accounting for 15.3% of total agricultural imports. In addition to soybeans and cotton, China also imports resource products such as frozen fish, palm oil, fish meal and wool. Degree of Participation in the World Trade System: China s economy has integrated into the world economy to a large extent. China not only benefits from globalization, but has also become a driving force in world economic growth, from which other countries benefit. China has become the largest destination of foreign direct investment. The degree of reliance of China s economy on foreign trade has now reached 67%. 1 The correlation of China s agriculture with the world market is increasing, the ratio of total agricultural imports and exports to agricultural gross value added (AGVA) increasing from 15.8% in 1992 to 20.3% in 2006, which indicates deeper integration into the world trading system. 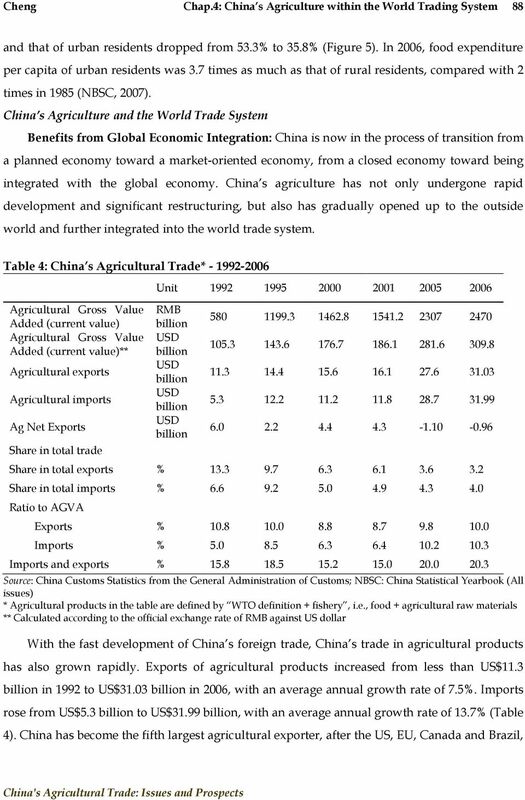 However, compared with China s economy as a whole, the degree of reliance of agriculture on trade was not that high. The ratio of China s agricultural exports to its AGVA is only 10%, whereas that of the U.S. is 41.1%, the EU 34% and Russia 36%. 2,3 For some leading exporters of agricultural products, such as Canada, Australia, Brazil and Thailand, the degree of reliance on agricultural trade stood as high as 99%-175%, which means the agricultural sector of these countries rely very heavily on the international market. Trade liberalization in international agricultural products is of great importance to their agricultural development. It is obvious that China s agricultural growth depends much more on domestic demand and agricultural resources are mainly used in producing major agricultural products, such as grain, for domestic consumption. In contrast, the degree of reliance on imports of agricultural products relative to AGVA has increased gradually from 5% in 1992 to 10.03% in China was the eighth largest importer of agricultural products in the early 1990s. Now it has become the fourth largest importer of agricultural products following the EU, the US and Japan. China is now the largest importer of soybeans, cotton, palm oil, wool, barley and sugar in the world. 1 Share of total trade value in GDP. 2 Due to the inclusion of forest gross value-added in the domestic AGVA, the degree of reliance of agriculture on trade is underestimated. The true degree is estimated to range from 10 to 20%. 3 Estimation based on World Development Index of the World Bank (2006). 12 Norw. Switz. Icel. Pol. Japan Hung. Can. EU China Czech. US N.Z. Aus. Avg. of world Cheng Chap.4: China s Agriculture within the World Trading System 92 Further Opening-Up in Agriculture: Post-WTO Accession: (i) The post-transition period of WTO accession: Although China s agriculture is not deeply integrated into the world agricultural trade system, since China joined the WTO in 2001, the barriers to further opening up to the international market, have been lowered. Particularly, since 2005, with the end of the transition period, and entering the post-transition period, China has become one of most liberalized countries for agricultural products. First, the tariff level for agricultural products had been reduced to the lower bound rate, from 23.2% in 2001 before WTO accession to 15.3% in 2006, a level much lower than the world average of 62%, making China one of the countries with the lowest tariff level for agricultural products (Figure 6). Second, tariff rate quotas (TRQs) on key agricultural products, such as grain reached their peak in 2004, and are expected to remain at this level. For example, the TRQ for wheat is million tons, corn 7.2 million tons, sugar million tons, and cotton 894,000 tons (Table 7). More than 90% of wheat trade is operated by state trading enterprises (STEs), The share of imports under STEs in other agricultural products will be scaled down gradually. 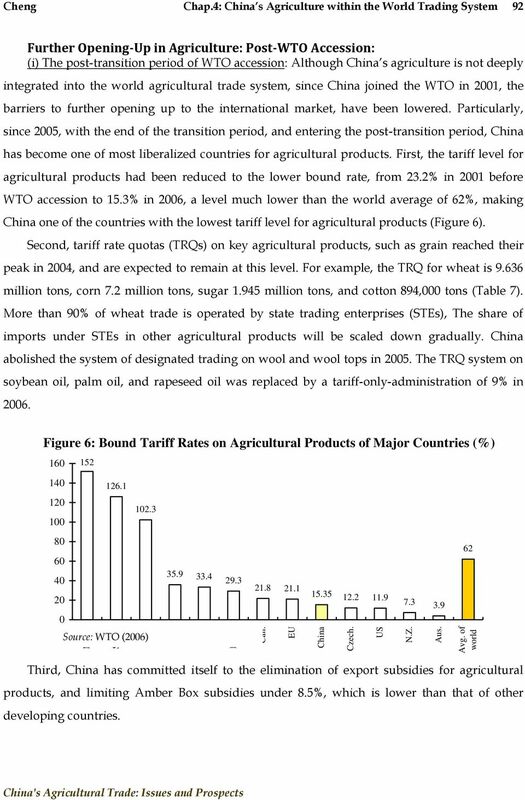 China abolished the system of designated trading on wool and wool tops in The TRQ system on soybean oil, palm oil, and rapeseed oil was replaced by a tariff-only-administration of 9% in Figure 6: Bound Tariff Rates on Agricultural Products of Major Countries (%) Source: WTO (2006) Third, China has committed itself to the elimination of export subsidies for agricultural products, and limiting Amber Box subsidies under 8.5%, which is lower than that of other developing countries. 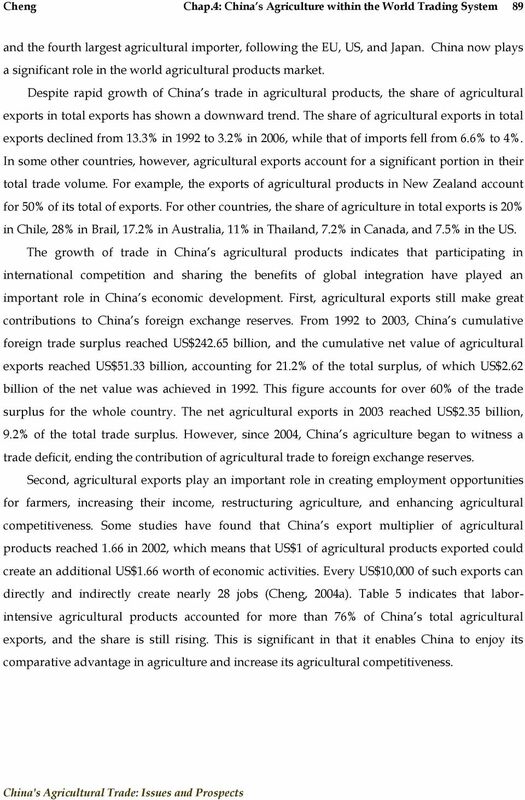 15 Cheng Chap.4: China s Agriculture within the World Trading System 95 characterized by a large transactions volume (both imports and exports). A trade deficit will likely become common, which could be a potential factor affecting the balance of payments. Third, it will be more difficult to avoid and manage risks due to the international market. With all industries open to the outside, China will face more and more risks and challenges from international markets and it will be harder to avoid and reduce these risks, especially in the agricultural products market. For example, at the end of April 2004, soybean prices in the international market fluctuated drastically. The market risk immediately spread to China s market through multinationals marketing chains. As a result, the domestic soybean crushing business suffered losses as high as RMB 5 billion. Fourth, the environment for international agricultural product trade will become increasingly complex. China will enter a period of frequent trade frictions. Technical barriers to trade, anti-dumping rules, and specific safeguard mechanisms will become the major barriers to China s agricultural exports. 4 New barriers such as public opinion barriers are also emerging. 5 Developed countries continue to provide subsidies to agriculture, which distort international agricultural trade. The Doha Development Agenda that aims to establish new rules of international trade, including trade in agriculture, is facing a dilemma. 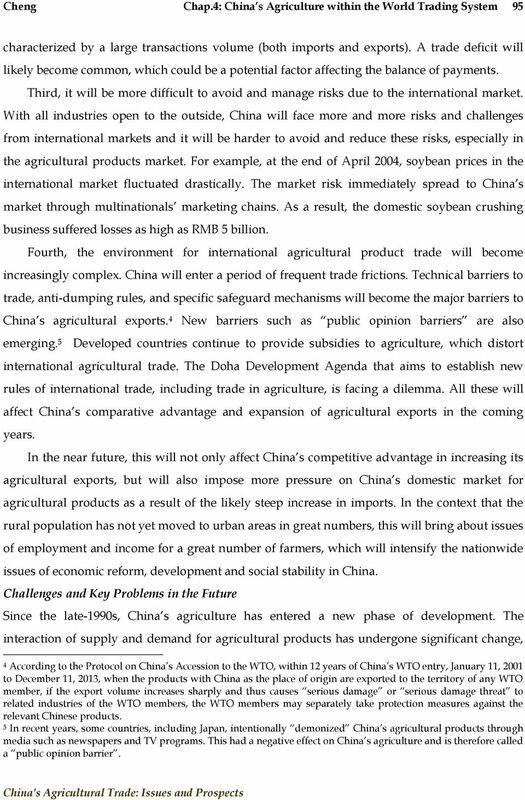 All these will affect China s comparative advantage and expansion of agricultural exports in the coming years. In the near future, this will not only affect China s competitive advantage in increasing its agricultural exports, but will also impose more pressure on China s domestic market for agricultural products as a result of the likely steep increase in imports. In the context that the rural population has not yet moved to urban areas in great numbers, this will bring about issues of employment and income for a great number of farmers, which will intensify the nationwide issues of economic reform, development and social stability in China. Challenges and Key Problems in the Future Since the late-1990s, China s agriculture has entered a new phase of development. The interaction of supply and demand for agricultural products has undergone significant change, 4 According to the Protocol on China s Accession to the WTO, within 12 years of China s WTO entry, January 11, 2001 to December 11, 2013, when the products with China as the place of origin are exported to the territory of any WTO member, if the export volume increases sharply and thus causes serious damage or serious damage threat to related industries of the WTO members, the WTO members may separately take protection measures against the relevant Chinese products. 5 In recent years, some countries, including Japan, intentionally demonized China s agricultural products through media such as newspapers and TV programs. This had a negative effect on China s agriculture and is therefore called a public opinion barrier. 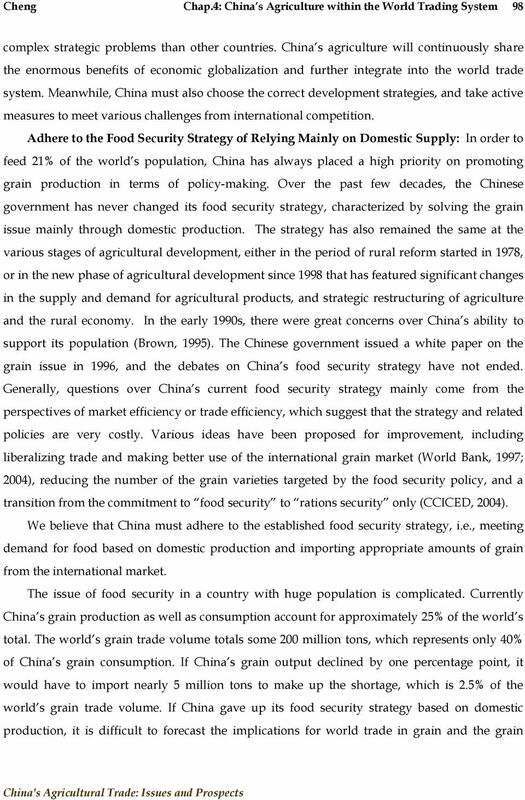 16 Cheng Chap.4: China s Agriculture within the World Trading System 96 achieving an historic transition from chronic shortage to approximate equilibrium or even excess supply in bumper harvest years. With income growth, and significant changes in consumption tastes and preferences, consumers demand agricultural products in greater quantity and of higher quality. Agricultural development was constrained by resources in the past and is now constrained by both resources and markets. Since WTO accession in 2001, China s agriculture has become integrated into the global economy, where it faces competition from home and abroad. 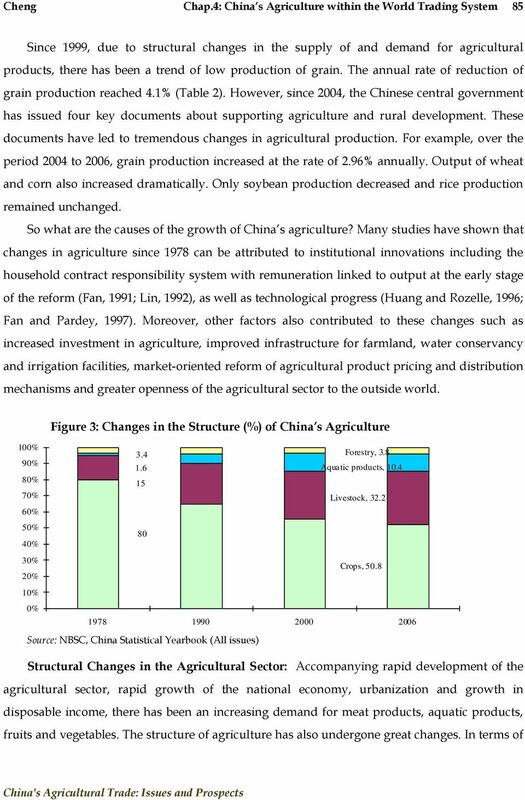 Both the environment and conditions of China s agricultural development have undergone profound and significant changes. In the next few years, China will enter a new stage when its per capita GDP will increase from US$1,000 to US$3,000, a stage characterized by accelerated industrialization, urbanization and modernization. International experience indicates that it is not only a stage of strategic opportunities, but also a stage of challenges and conflicts. In such a critical period, it is important to solve the key issues concerning agriculture, rural areas and farmers and continue to give play to the role of agriculture and the rural economy as a pillar for the national economy. These issues not only have a bearing on increases in farmers incomes, improvement of agriculture efficiency and development of rural areas, but also have a direct impact on China s grasp of strategic opportunities. They are of great significance for China s national economy and social development. 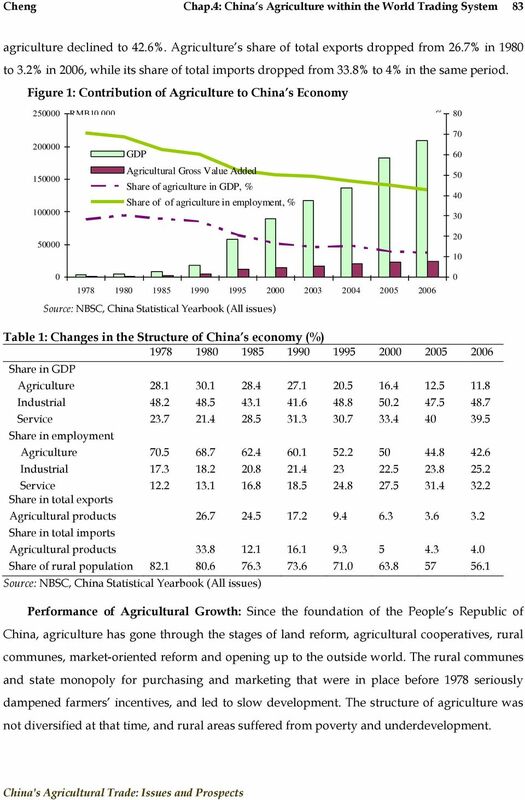 However, agriculture is still the weakest link in China s national economy. A number of deep-seated problems restricting the development of agriculture and the rural economy have not been fundamentally solved. In the foreseeable future, China, as a major developing country, will face more and more pressure and challenges in agriculture development. These pressures and challenges are as follows. First, an increase in population and the resulting growth in demand for grain will place great pressure on China s agriculture. China s population reached billion by the end of 2006 and is expected to reach billion by If calculated according to current grain consumption patterns, demand for grain will be no less than 500 million tons by China s grain production capacity is 470 million tons at present. It is quite difficult in terms of both material conditions and technology to expand capacity to 500 million tons in 5 years. 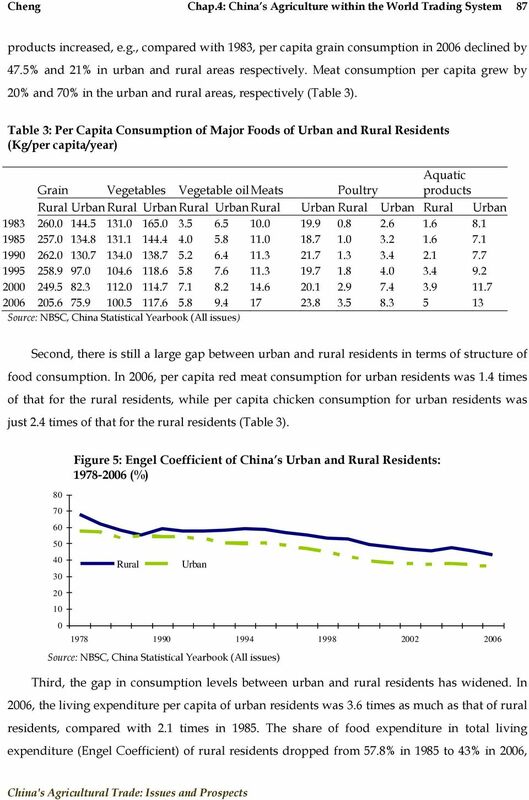 How to ensure food security for a huge population will become an unavoidable strategic issue for China s agriculture. 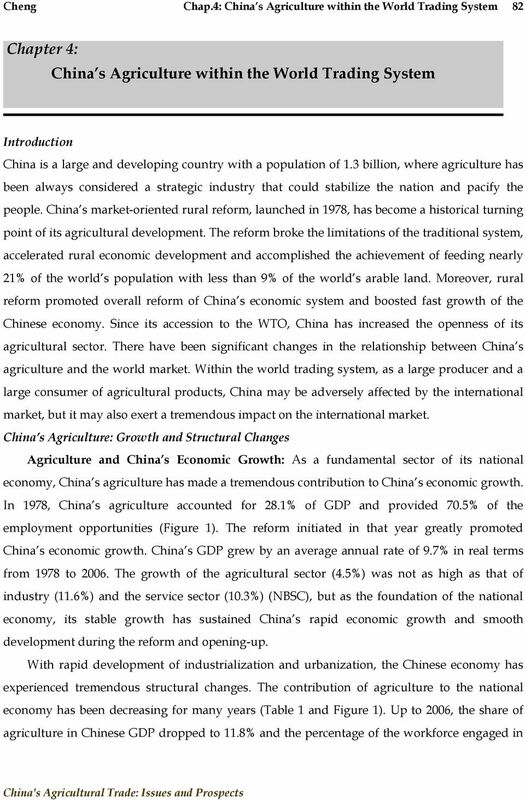 19 Cheng Chap.4: China s Agriculture within the World Trading System 99 market. Also, it is questionable whether China has enough purchasing power to guarantee the supply of grain. Will China be able to bear the consequent adjustment and social cost? Will other grain importers, especially those developing countries suffering from grain shortages, be able to tolerate and adjust to the consequent changes in the world s grain supply-and-demand relationship? We argue that food security in a country with a huge population is more than simply an economic and trade issue. 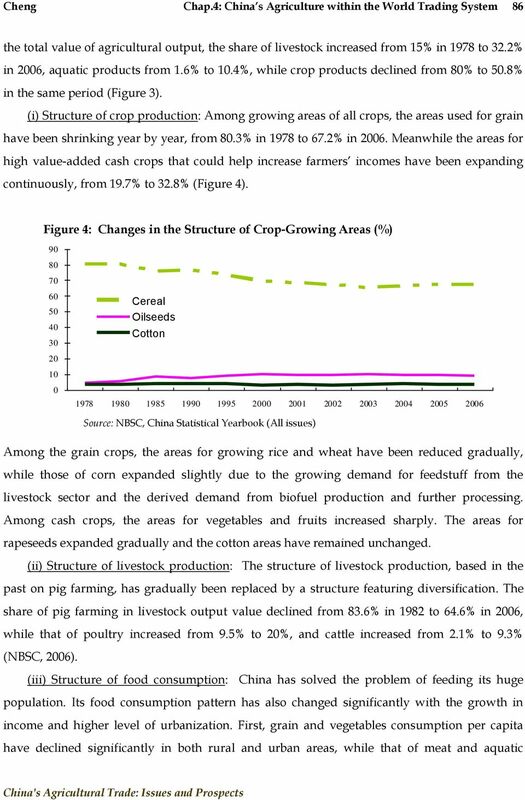 This helps one understand why China still gives high policy priority to agriculture when it is doing its utmost to promote the market economy system and further opening-up. 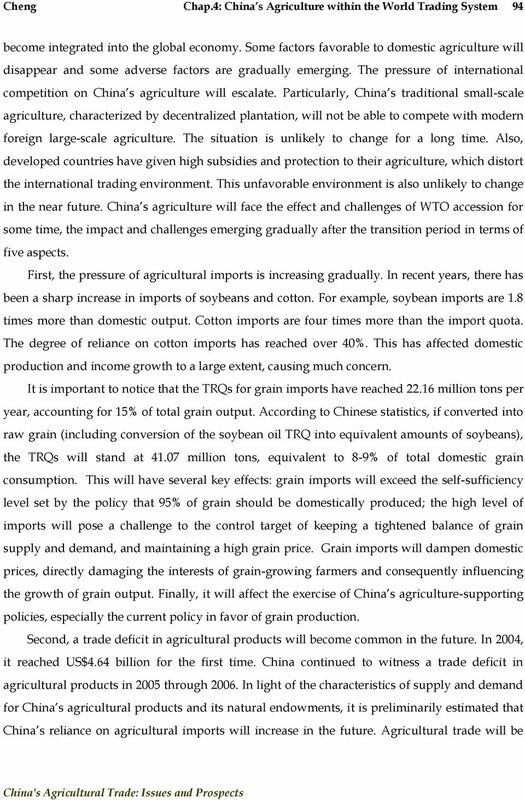 6 The conditions for relying on grain trade in China have not been met yet. Based on domestic production does not indicate isolation from the global market. Since the 1980s, China has been exploring ways to make better use of the international grain market. In the mid-1980s and in the early and mid-1990s, the country imported grain in large quantities. In 2004, China imported as much as million tons of grain. However, putting aside the worries about instability in the international grain market and other non-economic risks, technically speaking, the country is basically not prepared to rely on the international market for grain. For example, there are problems such as slow development of the domestic market, unsound grain markets, underdeveloped trade associations, separate national markets and lack of risk management mechanisms and tools. 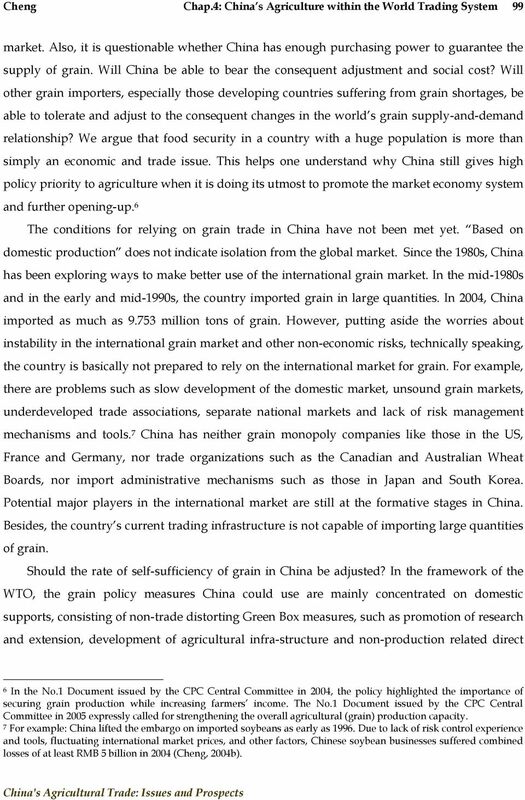 7 China has neither grain monopoly companies like those in the US, France and Germany, nor trade organizations such as the Canadian and Australian Wheat Boards, nor import administrative mechanisms such as those in Japan and South Korea. Potential major players in the international market are still at the formative stages in China. Besides, the country s current trading infrastructure is not capable of importing large quantities of grain. 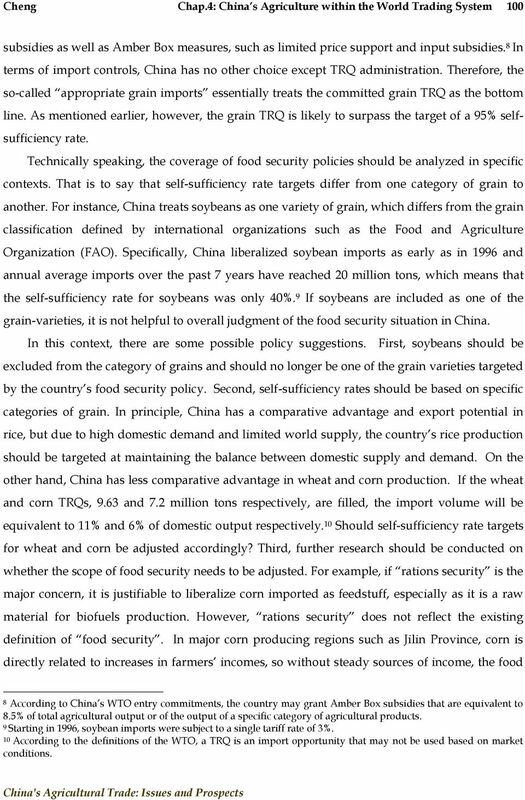 Should the rate of self-sufficiency of grain in China be adjusted? 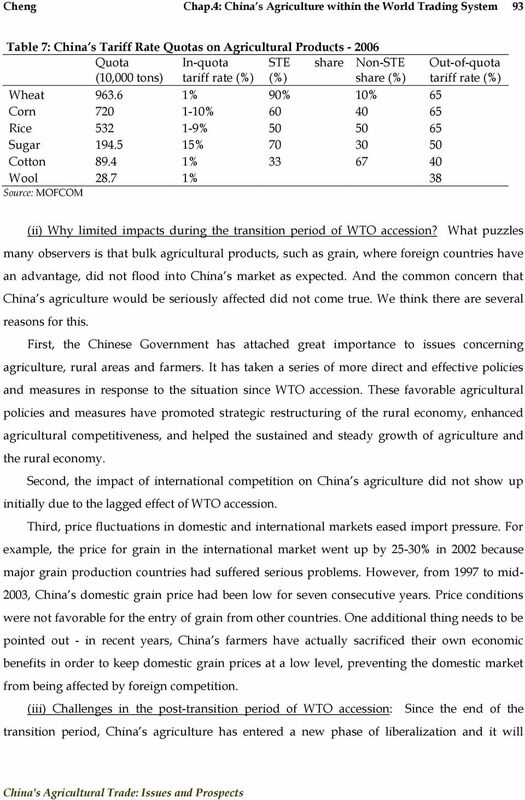 In the framework of the WTO, the grain policy measures China could use are mainly concentrated on domestic supports, consisting of non-trade distorting Green Box measures, such as promotion of research and extension, development of agricultural infra-structure and non-production related direct 6 In the No.1 Document issued by the CPC Central Committee in 2004, the policy highlighted the importance of securing grain production while increasing farmers income. The No.1 Document issued by the CPC Central Committee in 2005 expressly called for strengthening the overall agricultural (grain) production capacity. 7 For example: China lifted the embargo on imported soybeans as early as Due to lack of risk control experience and tools, fluctuating international market prices, and other factors, Chinese soybean businesses suffered combined losses of at least RMB 5 billion in 2004 (Cheng, 2004b). 20 Cheng Chap.4: China s Agriculture within the World Trading System 100 subsidies as well as Amber Box measures, such as limited price support and input subsidies. 8 In terms of import controls, China has no other choice except TRQ administration. Therefore, the so-called appropriate grain imports essentially treats the committed grain TRQ as the bottom line. As mentioned earlier, however, the grain TRQ is likely to surpass the target of a 95% selfsufficiency rate. Technically speaking, the coverage of food security policies should be analyzed in specific contexts. That is to say that self-sufficiency rate targets differ from one category of grain to another. For instance, China treats soybeans as one variety of grain, which differs from the grain classification defined by international organizations such as the Food and Agriculture Organization (FAO). Specifically, China liberalized soybean imports as early as in 1996 and annual average imports over the past 7 years have reached 20 million tons, which means that the self-sufficiency rate for soybeans was only 40%. 9 If soybeans are included as one of the grain-varieties, it is not helpful to overall judgment of the food security situation in China. In this context, there are some possible policy suggestions. First, soybeans should be excluded from the category of grains and should no longer be one of the grain varieties targeted by the country s food security policy. Second, self-sufficiency rates should be based on specific categories of grain. In principle, China has a comparative advantage and export potential in rice, but due to high domestic demand and limited world supply, the country s rice production should be targeted at maintaining the balance between domestic supply and demand. On the other hand, China has less comparative advantage in wheat and corn production. If the wheat and corn TRQs, 9.63 and 7.2 million tons respectively, are filled, the import volume will be equivalent to 11% and 6% of domestic output respectively. 10 Should self-sufficiency rate targets for wheat and corn be adjusted accordingly? Third, further research should be conducted on whether the scope of food security needs to be adjusted. For example, if rations security is the major concern, it is justifiable to liberalize corn imported as feedstuff, especially as it is a raw material for biofuels production. However, rations security does not reflect the existing definition of food security. In major corn producing regions such as Jilin Province, corn is directly related to increases in farmers incomes, so without steady sources of income, the food 8 According to China s WTO entry commitments, the country may grant Amber Box subsidies that are equivalent to 8.5% of total agricultural output or of the output of a specific category of agricultural products. 9 Starting in 1996, soybean imports were subject to a single tariff rate of 3%. 10 According to the definitions of the WTO, a TRQ is an import opportunity that may not be used based on market conditions. 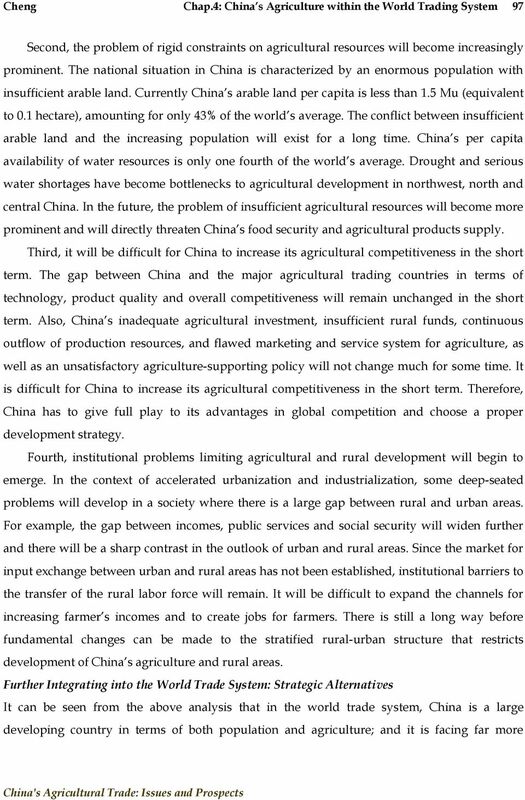 22 Cheng Chap.4: China s Agriculture within the World Trading System 102 that makes use of international resources as a supplement to China s serious shortage of land and water resources should be established. Second, releasing rural employment pressures should be a strategic starting point. China s rural surplus labor stands at million at present, and will be growing in the future. 11 Employment of farmers is the core difficulty in terms of the issues concerning agriculture, rural areas and farmers. This requires a shift in China s export strategy of farm products, from contribution to foreign exchange to contribution to employment. As far as China is concerned, solving the issues of employment and incomes of the rural population will be more significant in political terms than in economic terms for quite some time in the future given that China is at that stage of economic transition, where political interest in social stability is more important than that of foreign exchange earnings. This will also reflect the idea of making use of China s comparative advantage in labor-intensive farm products. 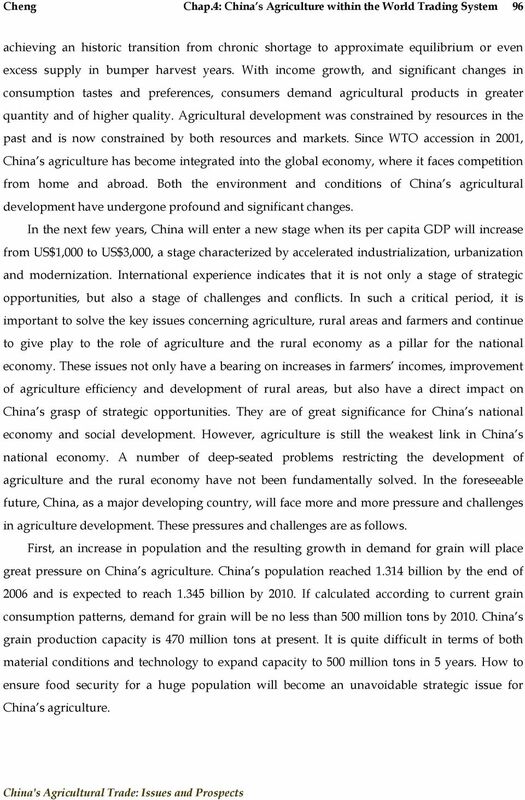 Third, increase China s agricultural competitiveness in the international market. One way to enhance the international competitiveness of China s agriculture is to develop self-patented know-how or introduce foreign technologies so as to improve the quality of products and their technical intensification. While taking advantage of its comparative advantage characterized by low labor costs, China must accelerate technical innovation and structural upgrading, deepen the processing of agricultural products and optimize the trading structure of farm products through introduction and development of new products. The combination of comparative advantage based on labor-intensive production and core competence characterized by technological innovation and structural upgrading would ensure the sustainable export growth of China s agricultural products and dynamic comparative advantage. Key Measures in the Near Future: Expand China s agricultural exports that have a comparative advantage through several measures. First, a systematic plan to promote agricultural exports should be made and greater support to agricultural exports should be granted, so as to increase the competitive edge of China s agriculture in coping with the increasingly complicated international trading environment and to offset the adverse effects of unfair trade practices. Second, set up a multi-dimensional, orderly and effective system of support and services for agricultural exports by combining product quality improvement with penetration of technical barriers; encourage corporate entities to carry out technical upgrading 11 Research team under the Ministry of Agriculture of China: Research on the Issue of China s Rural Employment and Utilization of Surplus Labour in the Early 21st Century, Rural Economy in China, May 2000. China s rapidly growing meat demand: a domestic or an international challenge? How will the Statistical Adjustment on Manufacturing Services on Physical Inputs Owned by Others Affect China s Balance of Payments Statistics? Trade Liberalization and Its Role in Chinese Economic Growth. Nicholas R. Lardy Senior Fellow Institute for International Economics Washington, D.C.